Bologna, the only large city in the Emilia Romagna region, has in its metropolitan heart a little more than 400,000 inhabitants occupying the seventh place of the most populated cities in Italy. Located at the point where the Apennine valley of the region opens in the plain, Bologna is considered an important cultural and artistic centre thanks to all monuments and historic buildings. The city offers the opportunity to dive into a spectacular reality where time seems to have almost stopped: medieval towers, ancient palaces, churches and long arcades are the heart of its historic centre, one of the largest in Italy. History and modernity blend together to create the right balance between past and future. 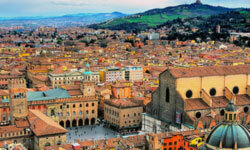 You can visit Bologna by renting a car at the Bologna airport or by renting a car at the Bolgna train station. An important city since ancient times, Bologna was founded by the Etruscans, whose first settlements were probably located along the Rhine, with the name of Felsina. It was the subject of several rulers throughout history: the first home of the Celts and then a Roman colony. In the Middle Ages it became a free municipality, conquering many of the neighbouring cities and experiencing a period of great economic prosperity and cultural ferment. These were the years of the birth of University of Bologna, one of the oldest in Italy hosting today thousands of students who enliven the streets of the city every year. The heart of the city is its old town, which extends for about 38 km. Called the city of arcades, Bologna is characterized by a countless number of churches and historical monuments that are visited by tourists every year from all over the world. Starting from Piazza Maggiore, the city shows its face through most ancient monuments and churches such as the St. Pietrino Church, imposing structure in the Gothic style dating from the end of the fourteenth century, the fountain of Neptune by Giambologna, the Town Hall and the Palace of the Podestà, rebuilt in 1485 next to the Palazzo Re Enzo. Moving to St. Stefano Square you will come across the complex of St. Stefano, also known as the "seven churches" because of the considerable articulation in many churches and chapels connected by a courtyard and a cloister. Continuing along the city streets you can also come across the St.Pietro and St. Giacomo Maggiore Cathedrals, the Basilica of St. Maria dei Servi with its Madonna in Majesty by Cimabue and its quadrangle Santa Maria della Vita which houses the terracotta Weeping Marias.